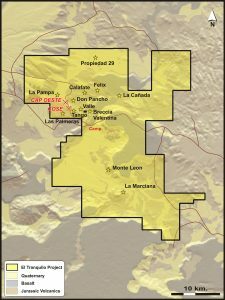 The 100% owned El Tranquilo block, comprising 27 contiguous tenements for a total area of 81,000 ha, is located on the western margin of the Deseado Massif, Santa Cruz Province, Argentina and includes the Cap Oeste and COSE deposits. The topography is subdued featuring arid, poorly vegetated plains with sporadic elevated basalt plateaux. The project is located approximately 50km by gravel road east of the National Highway 40 and is largely located on land owned by the company. Surface rights for much of the area owned by Patagonia Gold S.A. The stratigraphy of El Tranquilo project area comprises Triassic schist basement overlain by sporadic andesitic volcanics of the Bajo Pobre Formation followed by a thick, shallow SW dipping sequence of dacitic to rhyolitic pyroclastic deposits and flow-domes of the Chon Aike Formation. Persistent, thin, organic material rich sedimentary horizons define temporal breaks between eruptive pyroclastic events. A NE-SW oriented, graben style caldera is interpreted to truncate the project area. Hydrothermal sinters and eruption breccias have been documented. There are significant areas masked by Tertiary marine deposits and Quaternary glacial outwash deposits and basalt flows. NE-SW extensional tectonics during the Jurassic Period resulted in the development of a series of NW-SE striking normal faults with vertical movement exceeding 300m in places. Cap-Oeste Deposit: The Cap Oeste deposit is situated within a half-graben controlled by the NW-SE striking Bonanza Fault. Gold-silver mineralisation occurs within breccia zones where Bonanza Fault intersects a thick, rheologically competent rhyodacitic crystal rich ignimbrite. The highest grade mineralisation is located above a subvolcanic trachyte dome, which is interpreted as a source of precious metal bearing magmatic fluid. Gold and silver mineralisation occurs as iron, arsenic and precious metal sulphides within illite-sericite +/- kaolin matrix to clasts of brecciated crystal rich ignimbrite. There is very little free silica. Phase 1 is an early and extensive phase of illite rich breccia matrix, with gold and silver associated with abundant iron and arsenic sulphides. Gold and silver concentrations are typically less than 30 ppm and 200 ppm respectively. Phase 2 is a later, less extensive phase of mineralisation characterised by rare iron and arsenic sulphides, with free gold and electrum, and silver occurring in pyrargyrite, proustite and freibergte. Gold and silver concentrations frequently exceed 100 ppm and 1000 ppm respectively. El Tranquilo project area was first targeted in the mid-1990’s by Western Mining Corporation and Homestake Mining on the basis of clay alteration associated with NW-SE oriented lineaments. By 2002, Barrick Gold Corporation had taken control of the project. 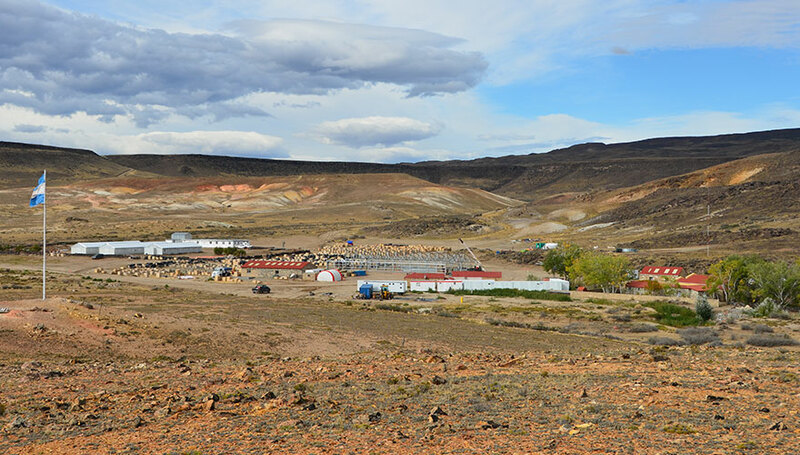 Barrick conducted widely spaced geochemical surveys and some Dipole-Dipole IP surveys and conducted a small drilling programme at the Brecha Valentina prospect. Three trenches were excavated at Cap Oeste, two of which intersected significant mineralisation coincident with an IP Chargeability anomaly. An extensive area surrounding Monte Leon is masked by Quaternary sediments and has yet to be explored. Numerous areas of the 81,000 ha El Tranquilo block remain inadequately tested, especially the strike extensions of the Bonanza – Esperanza Fault system where there is high potential for repetitions of bonanza grade shoots such as COSE. Parallel structural corridors have been identified, and remain untested.